Whether you're new to agriculture, or simply new to grape growing, there are several basic pieces of equipment for which you will need to budget ahead of time. Of course, buying all this equipment will put you well into the red within the first couple of years of planning. How can you keep some of these costs under control? Form a cooperative with local growers to share the costs of bulk fertilizers and chemicals. From spray schedules to block-by-block management, you will need a (fairly robust) computer: Most importantly, you'll need a computer with up-to-date software to maintain records and participate in educational opportunities, such as online certification, online workshops, etc. Peruse the resources page from this website and bookmark those that will be most useful. Northeast Beginning Farmers Project - This website is a great resource for those new to agriculture in the Northeast. Along with online and on-farm workshops, the NBFP also has resource guides to agriculture in New York State. 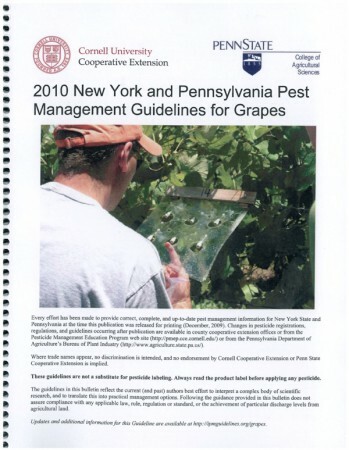 2010 New York and Pennsylvania Pest Management Guidelines for grapes. You can order one from your local Cooperative Extension Office. 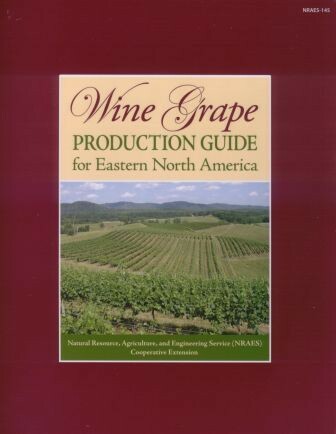 Wine Grape Production Guide for Eastern North America This is an essential must have for anyone growing wine grapes, regardless of experience level! Remember, the trellis should go in the same year your vines go in - you do not want your vines crawling along the ground because weed control and canopy training will be very difficult later in the season! If it is in your budget, laser planting allows for mechanization in the vineyard, because the rows and vines will be nearly perfectly aligned, which will help reduce the number of times vines are wounded by equipment moving through the vineyard. A tractor with a 3-point hitch in a well-marked field can work just as well. Regardless of your chosen method of planting, you will likely need grow tubes to protect the vines from weed sprays during the first part of the season. If you are planting by hand, you will likely need the majority of the following tools. Basic Hand Tools - hammer, wrenches, screwdrivers, etc. Pruning is the first means to control crop size in your vineyard. Pruning requires little equipment, but make sure you get good, comfortable pruners. You'll be using them a lot, so it's best they don't cause you pain. When you're growing grapes, you're always in the vineyard - there are two things you should always have with you: 1) pruners and 2) tying tape, even if you're just giving a quick tour to friends! Wire clips, Ag Tyes, twine, etc. Keep your shop tidy, and be sure to post appropriate signage!